You’ll have heard about the Charlie Hebdo shooting in January, when Muslim gunmen killed the editor in chief and apparently more than a third of the cartoonists at the magazine, among others. You may not have heard that there have already been other attacks since then, such as the St. Valentine’s Day shooting at a free-speech event in Denmark (CBS, Mark Steyn, more Steyn), or the beheading of 21 Egyptian Christians in Libya. As many have argued, if terrorists are going to try to impose an extra-legal, supra-national death penalty on anyone who draws Mohammed, then a lot more of us had better start drawing Mohammed. Ross Douthat takes a stab at thinking about the issue systematically. I think his three-point framework has a lot to recommend it. Does being insulted cause you to be violent? Then that’s proof you need to be insulted again. Instead of desensitizing people to massacres, maybe the media could work on desensitizing people to cartoons. The creator of the first Everybody Draw Mohammed Day urged in 2010, “Do your part to . . . water down the pool of targets” (Wikipedia’s paraphrase: “if people draw pictures of Muhammad, Islamic terrorists would not be able to murder them all, and threats to do so would become unrealistic”). Kathleen Parker agrees, “As for the rest of you characters: Draw to any heart’s discontent. It’s a free country. The National Review editorial on the subject, as usual, is also worth reading. The surviving staff of Charlie Hebdo, far from being bullied into silence, have continued to show true courage: Immediately after their fellow cartoonists were murdered, the survivors printed another issue, with a brilliant cover depicting Mohammed again, and as of last week, they are apparently back to the weekly schedule that is their namesake. One of the surviving cartoonists explained in January “that Charlie Hebdo must continue to publish. ‘Otherwise, (the Islamists) have won.’” If the ones who saw their friends and colleagues gunned down can continue to draw Mohammed, surely the rest of us can. In that spirit, I present a selection of drawings of Mohammed: the good, the bad, and the ugly. 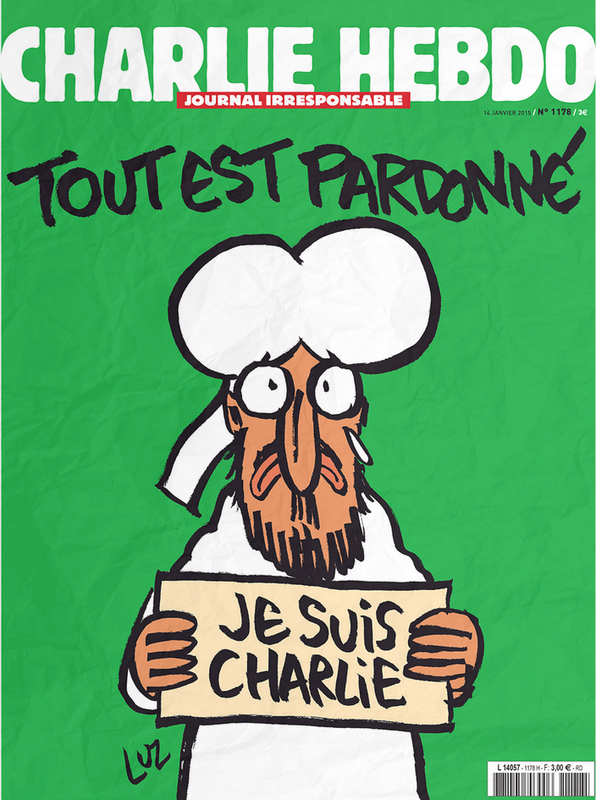 Cartoonists typically show solidarity after events like this by drawing blasphemous cartoons in defiance. The most common subject is Mohammed, drawn in a ridiculous, violent, or sexual fashion. While I think defiance is important, mockery isn’t my style. If all drawings of Mohammed are blasphemous to terrorist eyes, I see no reason to make one which mocks him. A drawing which celebrates him works just as well. A cartoonist in 2010 proposed Everybody Draw Mohammed Day and offered whimsical drawings of Mohammed as a spool of thread and a box of pasta. After serious threats on her life, the cartoonist apparently changed her name and went into hiding. On the other hand, it is also possible (for now) to depict Mohammed less favorably (and the more his followers murder people for depicting him, the less favorably some of us are inclined to view him). The courageous author of the witty (if not exactly G-rated) Day by Day comic has also tried his hand at drawing Mohammed more than once. Here’s a whole strip on the subject from 2010. They have a tradition in Sweden of roundabout dogs — canine scultptures that pop up mysteriously on Swedish roundabouts — and Lars Vilks decided to do a drawing of Mohammed as a roundabout dog. He wound up with a fatwa on his head. And one night he came home to find the jihad boys had firebombed his kitchen. There are some drawings of Mohammed that get a little gross. 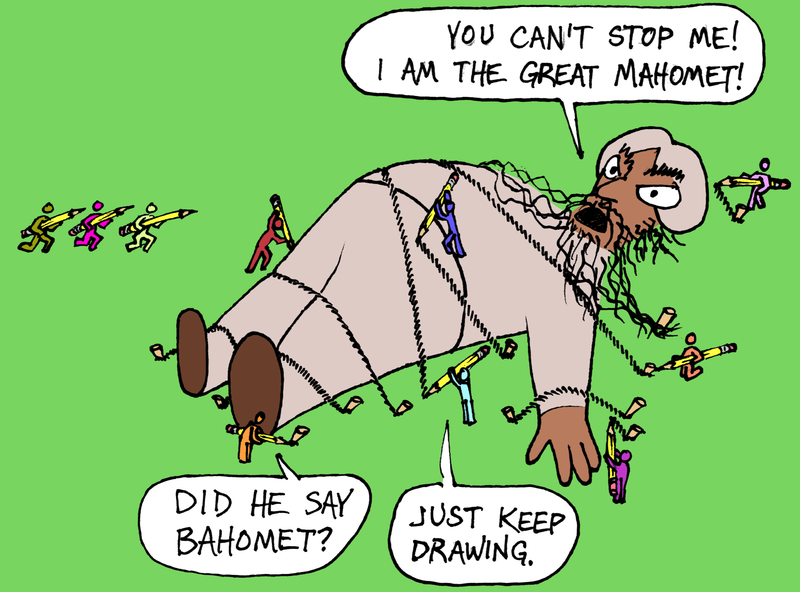 I won’t reprint them here, but they do count as drawing Mohammed; so I’m providing links to them, with the understanding that you won’t click on them if you don’t want to look at pictures like these. Day by Day again caricatures Mohammed, this time in a parody of one of Matisse’s Odalisque with Magnolias paintings. There is a whole Web site styling itself Draw Muhammad Day, a Tumblr blog, collecting drawings or other pictures submitted by the public. A lot of it is pretty gross and juvenile, on the level of middle-school graffiti—OK, I take that back, it’s more obscene than middle-school graffiti—but some of the submissions are all right, such as these two examples. Though Comedy Central prevented them from depicting Mohammed, the vulgar but sometimes incisive South Park creators fought the good fight and did succeed in producing the great pro-free-speech, anti-terrorism two-part South Park episode “Cartoon Wars”. In this video, the turbaned and robed character clarifies, “I am not Mohammed!” I’m giving the creators credit for courage anyway. Fixed typo in last paragraph. Honorable mention to the comic strip Over the Hedge for mentioning Draw Mohammed Day in 2010. A British newspaper discusses the fact that the Muslim world historically produced many drawings of Mohammed. For your contemplation only.If he had taken the WHOLE BIBLE into account there are plenty of verses were God instructs various Kings to slaughter every man,woman and child.Kills first born’s and generally is not very niece. Cherry picking verses is like astrology you can make the point for anything you wish.